Performing regular health checks for your birds can prevent minor problems from becoming major headaches. You probably already take mental notes of what’s going on with your flock on a daily basis. This article is to give you a few pointers on what you are looking for and how to deal with some of the minor problems as they occur. If you have a small flock, say less than ten birds or so, you may not need to keep a written record for yourself. I encourage you to write things down though. We are not always good at remembering dates and odd occurrences. Your notes can be as detailed as you like- if you are breeding birds details are important to note. Let’s get to work! This can be simple or more detailed, the choice is yours. You can see mine in the photo below. It is a relatively basic health chart for my laying flock. However, all vital areas are covered and there is room to make general notes. Remember, you are going to do this every month so keep it brief. Why am I doing this you may ask. The short answer is: to monitor the health of my flock on a monthly basis. It means I can pick up on illness and disease and generally catch them before they get sever. This column is for breed, age, tag # and ‘pet’ name if you wish. If the bird has an NPIP (National Poultry Improvement Plan) number you could put this here also. As you can see, I choose to put the hens’ age to the far right side. This column is reserved for comb (and wattles). Are they red and full, or dull and dry looking? Has she just finished brooding/laying? This will affect the appearance of the comb, so make a general note to the effect that she has started her molt. Any pecks or nicks? Dried blood? Any injury needs to be assessed and treated as appropriate. In winter it’s especially important to check large combed birds for frostbite, if found treat accordingly. Remember, Vaseline or similar will help to keep frostbite away! The beak is pretty straight forward, although it can be fractured- by a mousetrap for example. The upper and lower beak should meet and align perfectly. Some birds have a slightly elongated upper beak. If they are eating and drinking well, leave it alone. If it’s overgrown at the tip you can trim with nail clippers or file down with a Dremel tool. The beak is sensitive so don’t get over enthusiastic with the Dremel! Occasionally cross beaks are seen. Again, if eating ok just monitor, but cross beaks usually need filing at some point. Many cross bills need deeper dishes for eating and drinking. Hopefully you are just going to put a check mark here. Eyes should be clear, bright and alert. Check also for any drainage or discharge from the eye or nostril. A veterinarian can take a swab for you if needs be. This bird should be isolated when the discharge is noticed and only re-introduced when she has a clean bill of health. The eye can be an indicator of Marek’s disease. If the eye has changed from its normal color to grayish, possibly irregularly shaped, you should get the bird tested as soon as possible. Some birds have visual defects from birth or as a consequence of getting older. They can get cataracts or simply have encroaching blindness. Cataracts can be seen as a clouding of the lens in the affected eye. Generally, they seem to manage quite well. My Henrietta has been partially blind since she was a chick and she ambles around with the flock as long as they stay close to the barn. 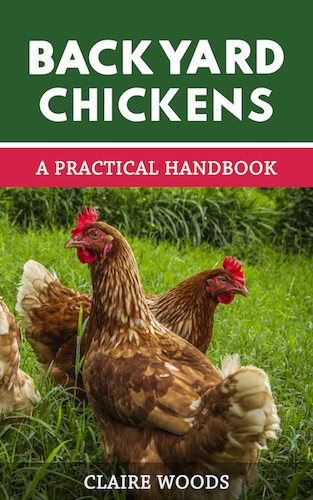 A quick tip for you: if you have a hen that is partially or fully blind, keep feeders and drinkers in the same place always. It makes life a bit easier for them! The feathers will ideally be glossy and ‘tight’, unless you have a Frizzle or a similar breed! A birds’ plumage after the breeding season looks worn out and many birds will molt at this time. This way they will have a nice, snug coat of feathers for the cold weather to come. The best layers in your flock will molt fast and regrow feathers fast- make a note of who the ‘superstars’ are. Something else to look for in the feathers are parasites. Lice and fleas are fairly easy to spot. Whereas, mites are tiny and not always seen with the naked eye. If you do see any, dust them down and repeat treatment in seven to ten days. If the hen has been constantly preening, it may be that parasites are bothering her, so dust her down just in case. If you can also supply them with a dust bath area it will help to keep the parasite load fairly low to non-existent. 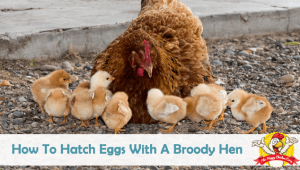 If your birds are reluctant to go to roost every night, treat the coop with poultry powder or a natural alternative, paying special attention to the roosts. It’s possible the birds don’t want to roost because of mites. The mites come out at night and bite the hen, so she has a miserable time trying to sleep. The crop is the quickest and easiest area to check. The crop is where the bird stores the food waiting to be digested. It should be empty in the morning when you let them out and full at bedtime. Assuming that you are doing checks during the day sometime, the crop should be full and rounded. It should not be pendulous nor should it be flat. When you gently squeeze the crop, it should feel mushy not rock-hard. If the crop is hard it could mean it is impacted. This is serious and your hen will need a veterinarian to help her. When inspecting the crop, if the hens breath smells like rancid milk, they have a sour crop. Other signs include: unwilling to eat and lethargic. You can try gently massaging the crop. This may work for a minor problem, but you may have to be more aggressive in your treatment. There are several treatment options for this problem, the one I prefer is simple, natural and easy to implement. You will need to isolate the hen and withhold food for twenty four hours- she can have clean, fresh water only. You can also give her a few drops of either olive or coconut oil by syringe to get things moving. Once the crop has emptied, give her some scrambled egg with a dollop of plain yoghurt. The yoghurt helps to rebuild the good bacteria in the crop. Once the crop is working again, keep the hen away from any long, fibrous materials such as grass and tough stems of plants. We now move down to legs and feet. The scales on the legs should be smooth and uniformly colored. In an older bird the scales are slightly rougher, but they should not be raised or uneven. If they are, she may have scaly leg mite. If you have feathered leg birds, check the legs very carefully for parasites it’s an area that is often missed. To treat this condition you should first soak her feet and legs in warm, soapy water. Remove her from the water and pat legs dry. Using an old toothbrush gently apply olive oil to the scales- be sure to get up and under the raised scales. Repeat treatment every couple of days until the new scales start to come in. This may take a while, possibly months. The bottom of the hens’ feet should be checked for any impacted dirt in the foot crevices or perhaps she has bumblefoot. This is an infection of the foot pad. It usually starts with a small cut or splinter to the foot. Bacteria enter the wound and set up shop. The bumble will look like a black or dark area which you cannot remove by rubbing or washing. The bumble will slowly grow over time which can cause a systemic infection of the hen. A veterinarian should be consulted about treatment options, which is usually antibiotics and the removal of the bumble. A last note about legs here: if your birds are banded, check that the band isn’t too tight or causing any problems. This brings us to the vent. A chicken who is laying will have a pink, moist vent. Those that are past their prime will have a pale, dry vent, although this does not prevent them from laying an occasional egg or two. Mites and flies love the vent area, so check carefully for any little black specks or any signs of irritated or raw areas. Use poultry dust or natural means to rid your birds of parasites. Note: Some folks use cat or dog flea medicine such as Ivermectin. This is an ‘off label’ use of the medicine and as such should only be prescribed by a veterinarian. There are recorded cases of neuro-toxicity in chickens. The vent is a favorite place for other birds to peck at, so any slight sign of injury or blood will lead to cannibalism if not caught quickly. A hen with vent issues such as prolapsed vent must quickly be isolated from her flock mates for her own safety. While you are checking the rear end, trim off any really poopy feathers, this will discourage flies from the area. The final column is activity. Is she acting normally, is she broody right now or is she appearing lethargic for no good reason? Usually this column just gets a check mark, but if she’s acting lethargic you will hopefully check her over more carefully and keep an eye on her progress. She may simply be having an off day. This is your notation area- remember to keep it brief. You will see on my chart the note is brief and usually dated, that’s really all you need. You can follow up on progress with the next months’ check. For example you will see that two of my hens have had bumblefoot removal. The area will be checked four or five days after surgery and if it looks healed, the notation will be put on the following months chart. Many folks keep records of who are the best egg layers so they can weed out the slackers in the flock. Also as noted earlier, breeders will keep good records of their breeding stock. 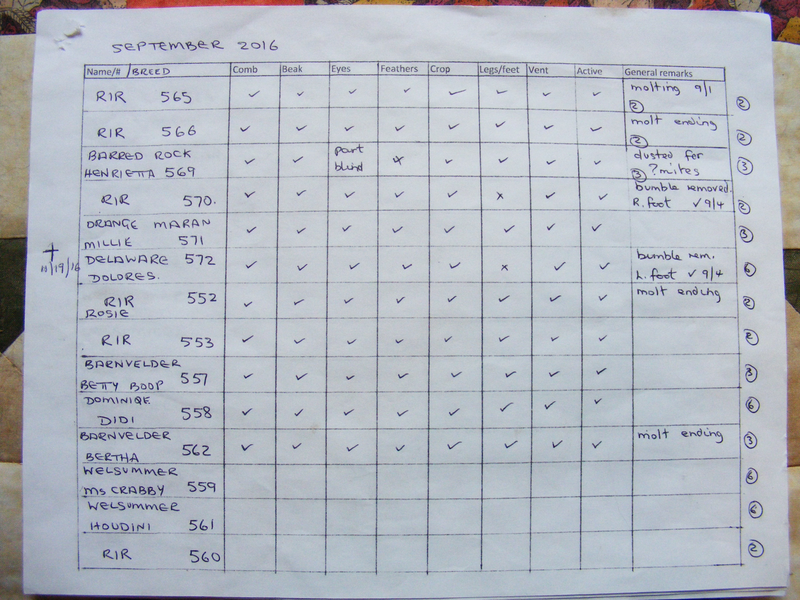 So, by extension, keeping a monthly check on your hens’ health is important for the health of the flock as a whole. It is far easier to treat one or two birds than your entire flock. The health check on your bird should take you no more than five minutes per bird, unless you uncover problems. Generally speaking though, the check is usually quick and simple- as long as your birds’ co-operate! If you do have some birds that are very skittish and don’t like being picked up, roosting time is the time to catch them. Also bear in mind, you don’t have to do all the birds in one day. I usually average around ten birds per day. 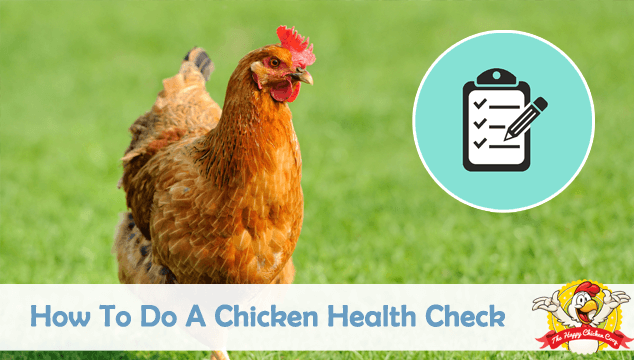 I’d love to hear what you include in your hens’ health check in the comments below! 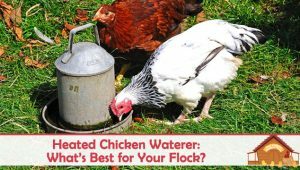 Heated Chicken Waterer: What’s Best for Your Flock? The Vaseline treatment on the hens and roosters combs to prevent frostbite is a great suggestion. We are having 28° temps as a high this week. I am going to use your chart for my girls. I would like to know what you think may be happening with two of my chickens. The older one is an ex battery hen(we don’t know her age) and the younger one is about 10 months old. Cheddar, the young hen(who lays one egg per day) has started pecking Chilli (the older hen who has never laid), on the neck and now Chilli is losing a lot of neck feathers. Why would Cheddar be doing this to Chilli? We also have another 10 month old hen,but she does not peck. Im a first time chicken mommy. This is my first year having my own flock, and it has been awesome, and frustrating all at once. They have been so much fun , and are each very unique with funny personalitys. I never thought that was true, until i actualy owned some of my own. I’m sorry to hear about this. I would start by reading our scaly leg article and then see if that matches what you’re seeing with Griselda. If it is, then you should start to treat it immediately. I have a very small flock so I usually do a health check about every other day or two. I check all of the things that you do but I also check their weight by feeling for the breast bone because I’ve discovered that they can lose/gain weight very quickly and I like to keep an extra eye on the ones that seem a little thin to make sure they’re eating and drinking okay. I would like to see information included on the health check on vital signs – normal ranges and how to obtain. Vital signs are a quick way to access general health.